This April is Earth Month, and various sustainability-oriented organizations and departments on campus are hosting events and activities over the course of the month. Events range from lectures, to a garden tour, to the debut of a new Snapchat filter based on designs submitted by students. Organizations such as the Climate Action Group, the Wesleyan Eco Facilitators, the Sustainability Office, the College of the Environment, and the Earth and Environmental Sciences Department are all involved in campus events and promoting sustainability on campus. On Thursday, April 12, the launch of the Spin Bikeshare program will take place on the Usdan Lawn from 11:30 a.m. to 1:30 p.m.
Sustainability Coordinator Jen Kleindienst described some of the dynamics of Bikeshare in an email to the Long Lane Farming listserv. Kleindienst explained that the bikes will cost $1 for every 30 minutes of use, and a pass for unlimited rides will be available for $29 a month. “We hope that this program will allow for more people to take advantage of the bikes, be it to get from one end of campus to the other when you are in a rush, or to take them out for a leisurely ride during the weekends,” she wrote. On Thursday, April 12, there will also be a presentation on the recent efforts to reinstate the M-Link service, a modified bus route that would provide a faster ride from Middletown to the Meriden Railway Station. The presentation will take place at the same time and place as the Spin Bikeshare launch. Jonathan Chester, an award-winning author, professional photographer, and environmentalist, will give a lecture on Antarctica within the context of the global environment and climate change on Friday, April 13. The talk will take place in Shanklin 107 from 6:30 to 8:30 p.m.
On Sunday, April 15, the Wesleyan Sustainability Office is hosting a tour of the Japanese Gardens around the College of East Asian Studies building, with a brunch following the tour. Morrell will be on campus to give a tour of the garden at 10:30 a.m.
April 23 to April 27 is Zero Waste Week, organized by the Compost Interns in the Sustainability Office. This is an annual week-long event, promoting the adoption of a zero-waste lifestyle on campus during this time period and beyond. Over the course of the week, educational events and activities will take place. This week will also be the week of the Clean Plate Challenge, which promotes student commitment to eating everything on their plates in order to reduce food waste on campus. On Sunday, April 29, the University’s Climate Action Group is hosting “EarthFest” on Foss Hill—this event will contain live music, tie-dye, and the debut of a Snapchat filter designed by students. There will also be multiple booths, including one at which students can write letters to legislators promoting sustainability on a governmental level. Luke Green ’20, one of the co-leaders of the Climate Action Group, described his excitement for the event, in addition to his excitement for the Bikeshare program. 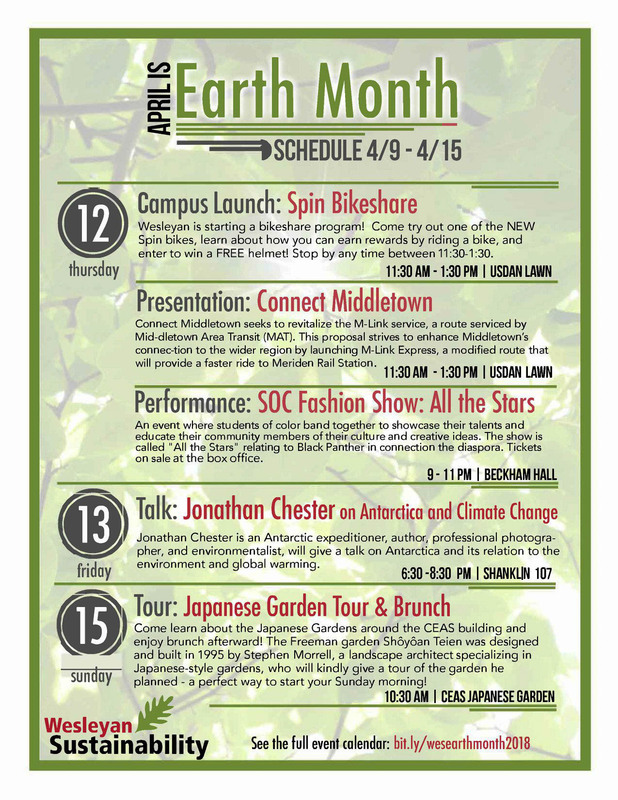 All of the events planned for this month are available for viewing on the Earth Month Calendar. Kleindienst, who has worked to organize many of the events, stated that any students hoping to host a sustainability-themed event this month can email her to have the event placed on the calendar. Kleindienst also noted that she hopes many University students will participate in the events this month. “I encourage anyone to stop by at least one event this month and step outside their comfort zone!” she wrote.